I love Christmas. But I really don’t like the stress associated with being Santa’s main helper every year. It’s a lot of pressure! We’re already busy with after school programs, play dates, work and other commitments. And, while I want to make the holidays as special as I can for my family, I have to consider: is it worth it if I’m short-tempered and stressed out? We place so much pressure on ourselves to buy the perfect presents, decorate like a pro and make Pinterest-worthy meals. Stop it. The kids rip off the paper, the decorations get put away after a few days and food ends up in your stomach, anyway. Have fun with your family and friends! It sounds simple, but sometimes we get caught up in the holiday hamster wheel that we don’t stop and actually enjoy what’s happening around us. Yes, you heard me correctly. Do you really need the pressure of making a gingerbread house and five kinds of homemade cookies (decorated by hand, of course! ); planning trips to go tobogganing, skiing and skating; hosting hot chocolate parties for the kids’ friends; purchasing and wrapping a zillion presents AND hosting family at the holidays? The kids probably won’t mind if you ask them to make a list of their top three holiday activities and just do those, instead of ALL THE THINGS. And if that makes me a Bad Mom, then so be it; I’ll wear that badge with pride! 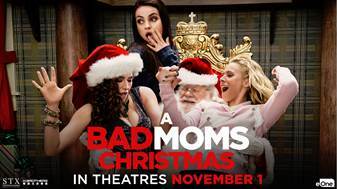 A Bad Mom’s Christmas is the perfect girls night out movie… it’s side-splittingly funny, raucous, naughty, touching and totally relatable, in that $hit, yeah! kind of way. I simply loved this movie, and so did my GNO date. It was the perfect way to decompress after a few busy, stressful weeks. And the lessons I learned from Amy, Kiki and Carla have already been put to good use. I asked my kids to tell me their top three favourite things to do during the holiday season, so I can be sure not to disappoint. The other stuff, though? It’s not on my priority list. I want to be more mindful this year and truly enjoy the time spent with my family. There will still be moments of insanity, but that’s what wine (or chocolate!) is for. Who knows? Santa might read this and bring me my very own elf, to whom I can delegate holiday tasks. Until then, I’ll be a Bad Mom. I hope you’ll consider joining me! Let’s give ourselves a break and focus on having the best holiday ever, without all of the stress. What’s one thing you’d like to give up to reclaim your holiday sanity? Disclosure: I saw an advanced screening of this movie to facilitate my review. No compensation of any kind was received. Snowed in?! Whoa!! We haven’t had enough snow to stick around yet in Toronto, but I’m sure it’s coming!! Wishing you a very Merry Christmas… and hoping you’ll get to see the movie as a holiday treat to yourself! I need to plan a girls night to get out to see this movie. I laughed my way through the first one. This Christmas I am making it less about the “stuff” and more about the fun! That’s a great way to put it… less about the stuff. That’s my aim, too! Merry Christmas!! Yes! There were so many great lessons I took away from this movie. It made for the perfect girls night too! I hope to see it again before the holiday season is over. Easily is one of my faves! Glad you loved it! My friend and I left with sore sides from laughing so hard… what a ride! Love these tips because it’s sort of how I operate anyway… I can’t wait to see this movie. The first one was hilarious! It’s how I *want* to operate… but sometimes it doesn’t turn out that way! You’ll love the sequel!